Ready for the Rás: The Castlebar CC UNIT 7 Rás team at their launch. Left to right: Richard Needham, Ian Gaurlay, Chris Troy, David Brennan, David Walshe, Jonathan Caulfield, Vincent Jordan and John Brennan. Photo John Moylette. The An Post Rás is an annual, eight-day, stage race around Ireland. The race is Ireland's number one cycling event and will take place from Sunday, May 21, to Sunday, May 28. The An Post Rás is Ireland’s only UCI (professional ) bike race. The epic race began in 1953 and has been held every year since. It is one of Ireland’s top sporting events bringing world class sporting action and a significant economic boost to towns and villages nationwide. The Rás has a worldwide reputation of being a gruelling challenge in the elite, international calendar. The open racing style allows amateur county and club riders to pit themselves against domestic and international professionals. On Monday, May 22, the Rás will come to Mayo where the peloton will entertain crowds in Cloonfad, Claremorris, Balla, Manulla and Kilnageer. The day’s third and final An Post Prime in Breaffy (108.5km ) is on the outskirts of Castlebar. Riders will battle through Westport to the finish in Newport. David Brody (Castlebar ) and Jason Prendergast (Louisburgh ) will be competing in this year’s Rás with Team Itap and are hoping to see a good finish in Newport, on familiar roads. The two cyclists have been in training over the winter months for the biggest race of the year and with their team Itap hope to compete with some of the professional cyclists for stage placings and jerseys. Brody, who has been cycling with Team Itap for three years, competed in the Rás last year and was happy to finish the eight day gruelling race in the bunch. Prendergast, who competed in it a few years ago, is looking forward to the challenge of racing against the best in the country. Also taking part in the Rás this year is the UNIT 7 Mayo-Castlebar Rás Team 2017. Castlebar Cycling Club has partaken in five Rásanna, from 2009 to 2013, enjoying some very notable successes including three first county rider prizes, two by Chris Coyle and one by Patrick Clarke. Castlebar CC was also the third county team overall in 2012, which in the context of competing against composite teams from all over Ireland, was probably the club’s finest achievement. 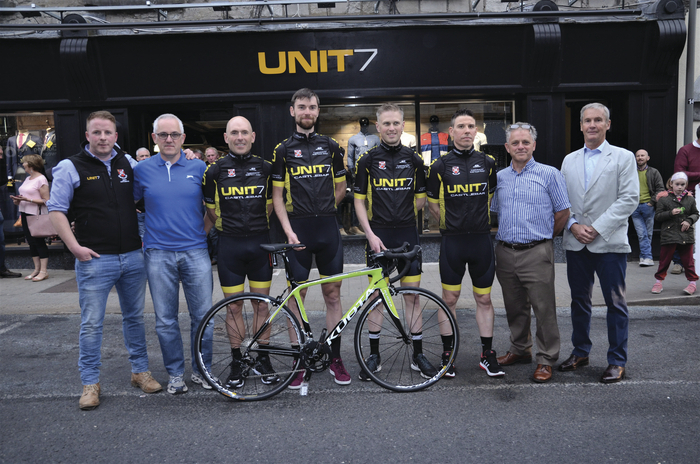 The 2017 UNIT 7, Castlebar Rás Team 2017 comprises five riders, all of whom are members of Castlebar Cycling Club. They are Chris Coyle, who is competing in his fifth Rás, Jonathan Caulfield, who is taking on the challenge of the Rás for the first time, Chris Toy, going into his third Rás, David Brennan, who will be hitting the Rás circuit for the ninth time, and David Walsh, who will be making his debut in this race. There will also be a strong Westport interest in the Rás this year with Westport Towers Bar and Restaurant team of James McGreevy, (Westport ), Richard Meaney (Westport ), Charles Prendergast (Louisburgh ), Sean O'Malley (Ballinrobe ) and Paddy Clarke (Ballina ) taking on the race in their colours. We'll be bringing you right inside the Rás this year with Team iTap's Jason Prendergast writing a daily diary of how the Rás is going for him, so make sure to check out www.advertiser.ie/mayo to keep up to date to find out what it's like in the peloton.